1-CD with 28 pages booklet, 20 tracks, 49:39 min. When Suzie walked onto the huge stage of the Kungliga Tennishallen in Stockholm, Sweden October 26th 1963, she had just turned seventeen. The opening act, a Liverpudlian pop group named The Beatles, had just finished their set and the crowd was now eager to hear Suzie sing Johnny Loves Me. The attractive female singer was by no means a newcomer to showbiz. At fourteen, Suzie had toured Europe and Northern Africa. A spontaneous stage appearance in Stockholm early 1963 marked the start of a multinational career that would spawn many popular songs and recordings in seven different languages. 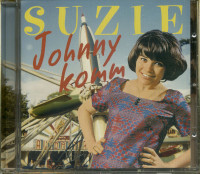 On this Bear Family CD all of Suzie’s German language recordings are gathered together for the first time. Maria Pereboom was born August 21st 1946 in Tilburg, Holland. Her father was a merry-go-round builder and from April to September every year he took his family to various amusement parks all over Europe to set up his inventions. While her father prepared his 'rocket-infused' rides, her mother was busy selling tickets. Maria and her sister Margreth got an unusual and exciting childhood, and even if they missed a few of the things kids usually pick up in school, it certainly wasn't the case when it came to learning languages and geography. Around 1960 the Pereboom family was working at an amusement park in Finland where a talent contest was being held. Maria entered with Que Sera and won first prize. From the hands of famed American singer/songwriter Paul Anka she was awarded with a package of crackers. Shortly afterwards, in Klampenborg, Denmark, Maria witnessed a performance by a U.K. group called The Nicholls Family (later known as The Hi-Grades). She fell in love with the bass player, Mike Watson, who in 1965 was to become Maria's first husband (in 1966 Watson joined Swedish pop group The Lee Kings and later he played bass behind both Wilson Pickett and ABBA). The Nicholls Family needed a female vocalist and at fourteen Maria left her parents to go on tour with the English group. Now calling herself professionally by her childhood nickname 'Suzie', she toured G.I. bases and amusement parks all across Europe and, at times, even down to North Africa. After two years filled with extensive touring Suzie started to miss her parents. She found out they were in Stockholm doing work at Gröna Lund and went there. Suzie's younger sister had told people in Stockholm that her sister was a rock 'n' roll singer and Suzie was more or less forced to prove her skills on the stage at the Jump In Club. Some influential music business people were in attendance that night and managers from Sonet Records and a Swedish rock 'n' roll star, Jerry Williams (not to be confused with American soul singer Jerry Williams Jr. a.k.a. Swamp Dogg), were knocked out by Suzie's interpretations of songs originally made popular by Wanda Jackson, Connie Francis and Brenda Lee. Before she had the chance to really understand what happened, Suzie found herself in a recording studio with Larry Finnegan, who at the time was hot in Sweden following the success of Dear One. Larry wrote and produced Johnny Loves Me and the record took off with a bigger blast than any of Suzie's dad's 'rocket-merry-go-rounds'. Larry Finnegan was a perfectionist in the studio and Suzie recalls with horror the endless sessions where take after take was demanded. While working with Finnegan, Suzie didn't have much input when it came to choosing what songs should be recorded. She didn't feel comfortable with some of the material Finnegan imposed. Even though Suzie wasn't entirely pleased with her output, her records tell a different story. Singles like Coolie, Down By The Riverside and Don't Let It Happen Again established the Dutch-born songstress as one of the brightest stars in Sweden. In 1964 Suzie was featured in the motion picture comedy 'Åsa-Nisse I Popform'. The song showcased in the movie never saw a release on record but it's quite clearly based on Millie Small's My Boy Lollipop. Customer evaluation for "Johnny komm"